"Glen Falconer was passionate about friends, familly, and great IPAs. So in tribute, we've created an IPA worth of this master brewer. Made with Falconer's Flight hops from Hopunion, LLC, a blend named for Glen himself. The result is a bright, moderately bitter IPA with stonefruit aromas and a strong malt backbone. We think Glen would have approved. Proceeds from the sale of Falconer's Flight hops go to the Glen Hay Falconer Foundation, providing scholarships to professional and aspiring brewers. In addition, Widmer Brothers Brewing is making a donation to grant two additional scholarships. Learn more at www.glenfalconerfoundation.org. Prost! To true hop heads"
Grabbed a 12-pack at a local Fred Meyer for about $13.99 on sale. I love when I see a brand new release on sale. - Pours a clean and clear copper color. Thick slightly off-white head.. very creamy and settled slowly to a thin blanket that seems to be sticking around. Large ring of suds sticking around the glass. A bit dark, but overall a good looking beer. - This beer smells quite good. Lovely crisp NW hop aromas. Quite pine-like, and zesty bitter. Smells like a slightly sweet and bready malt backbone. Light caramel, and light honey. The smell of fresh grassy hops certainly shine through. 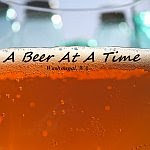 - Very light malt flavors received from what I was expecting via the color and smell of the brew. Bready light caramel, slightly sweet, but not overly sweet. The bitter pine and grassy hops shine and balance this IPA out very well. The hops also seem to have a creeper effect via the palate. Great zesty and spicy hops with a zing of fruity character which isn't found in the smell so much. Overall super balanced, and has some very great flavors hidden within. - Light to medium bodied, and slightly watery up front, but the finish hits late with a drying and slightly cloying hop punch. Very interesting character and feel to this beer. It is bubbly, sparkling almost.. well carbonated. Just a touch thin. - It's too difficult to compare this IPA to the previous X-114 in the series. It is a completely different IPA. I must say that I love the hops in this beer. I think I am a new fan of this Falconer's hop. The classic fresh quality is quite striking for me, and the beer is superbly balanced. Go grab it! I think I dig it more than the X-114. Will be interesting to compare my score and see it be less than the X-114 review of mine. Sad to say, I think Falconer is a dreadful IPA...a dreadful beer. I first tasted it at BBC11 and thought it was iffy. I tasted it again later and concluded my first thoughts were correct. This beer just doesn't have the aroma and hop flavor I want in an IPA. 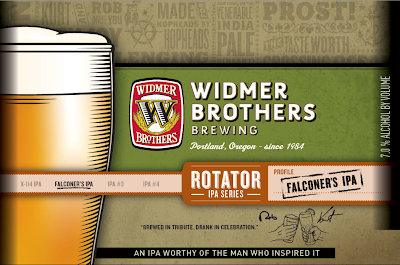 I think Widmer blew it with this beer. Broken Halo and X-114 were much better. Of course, I know opinions will differ. Wow.. I am surprised. I think this beer has plenty of hop character.. and is very well balanced with a malt that isn't overly sweet. I wonder if it is just more refined now? I was never a huge fan of Broken Halo, and still think this one tops the X-114 a touch. But like you said... opinions will differ.